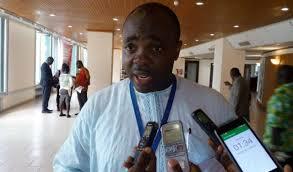 Minister-designate for Youth and Sports Isaac Asiamah has promised not to focus all his energies on football but ensure the development of all sporting disciplines if he gets the nod from parliament. In this regard, he told Ghone TV shortly after President Nana Addo Dankwa Akufo-Addo had named him as for the Youth and Sports role on Thursday 12 January: “I’ll not be a Minister of football; I’ll be the Minister for Sports. The Atwima Mponua legislator was a member of the Parliamentary Select Committee for Youth and Sports when the New Patriotic Party (NPP) was in opposition. He also served on the Public Accounts Committee in the past. He was a member of a delegation that met the senior national team, Black Stars, to assure them of government’s support in all their endeavours before the team departed to the United Arab Emirates for their pre-tournament training camp. Mr Asiamah, if approved by parliament, will have the difficult task of ensuring the Black Stars qualify to the 2018 FIFA World Cup in Russia. He is also expected to create a cordial relationship between the Ghana Football Association and the Ministry, which turned sour when the former sector minister, Nii Lante Vanderpuye, was in charge.